We all prefer a peaceful and comfortable life however life is filled with many problems. There is no one who would prefer their own life to end abruptly without solace. Therefore, isn’t it better to live carefully as we grow older? To live in such a way, everyone seeks some kind of help or refuge. Most people forget or ignore the fact that life is unbelievably risky and uncertain! We cannot predict what kind of misfortune will come our way at any moment. One can see a certain kind of helplessness in whichever angle we look at life. There is a certain kind of insufficiency in life that we cannot express in words. How many people spend their lives sighing with regret and facing the consequence of their previous misdeeds? How many lives are filled with mental anguish and painful hearts? Isn’t life truly without protection? Isn’t the mind filled with great uncertainty about the future due to this state of affairs? Many people pursue various things to safeguard their lives. They run after auspicious times, divine pronouncements, divine protection, the protection of gods connected to the nine planets, the help of miracles, and miraculous blessings. They are compelled to look for the help of some mystical force. However, our helplessness is so great that we are not motivated to question the truth or untruth of any of these practices. 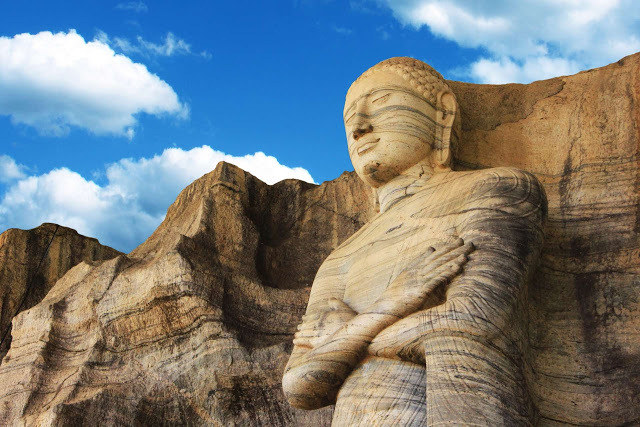 The Buddha revealed an amazing secret about gods in a discourse named ‘Dhajagga sutta’. The Buddha explained that even those gods, whose minds are filled with defilements, become helpless and run away in fright and panic when faced with sudden misfortunes. If the same gods that we fearfully plead for protection from are as helpless, panicked, and flee from misfortune as we do, isn’t it a delusion to think that we could gain protection from such deities? This is not to say that gods do not exist. It is only to emphasize that they are as helpless as we are. But it is a very good practice accepted by the noble ones to share the merit of our wholesome actions with the gods as well. However, we should have the ability within ourselves to identify the greatest noble source that is capable of providing great help and refuge in this life. We should be able to consider wisely and realize certain things. We must listen to and learn the teaching of great teachers. The Supreme Buddha possessed an exceptionally marvelous, unmatched spiritual power. It is impossible to see anyone else with such unblemished purity, serenity, magnificence, and nobility of character. The Buddha’s life was filled with noble qualities such as love, kindness, compassion, patience, humility, intelligence, wisdom, and was without dishonesty. Followers of sects with wrong views as well as certain ignorant disciples, envied the profoundly dignified life of this noble gem who was clad in a robe, content to survive on alms-food, and lived a simple life. A disciple named Devadatta tried to harm the life the Buddha on several occasions. On one occasion, he made a fierce elephant named Nālāgiri drunk and sent it to attack the Buddha. As well, he sent teams of assassins to kill the Buddha. But all those attempts failed. In the end, Devadatta decided to end the honorable life of the Buddha with his own hands. On that day, the Blessed One was walking with a tranquil mind at the foot of the Gijjhakūta mountain. Devadatta climbed the mountain and pushed a large rock aimed at the Supreme Buddha’s head. But, what happened then was amazing indeed. There were no humans or gods around to save the Buddha from this danger. However, the great earth sprang to action at that moment. A large rock suddenly appeared from the ground and blocked the rock pushed by Devadatta. Once more it became clear to the world that the Supreme Buddhas could not be murdered by any external scheme or plot. The Supreme Buddha is the unmatched, unique, and infinitely pure leader of all three worlds. The Buddha’s greatness is unrivalled. Once, the Blessed explained this to Veranja a nobleman. So how can we find someone in this world to be even remotely comparable to the Supreme Buddha? Let’s rejoice abundantly in our good fortune to have selected such a great spiritual leader. We are definitely not followers of leaders of any other sects or religions. All of us are disciples who have gone for refuge to only the Supreme Buddha, with great love and confidence. We have gone for refuge to the sublime Dhamma that the Supreme Buddha taught with complete realization. We have gone for refuge to the noble disciples who have attained the fruits of the Noble Eightfold Path. In this way, we have found refuge in the Noble Triple Gem. The Supreme Buddha himself explained how one would go for refuge to the Noble Triple Gem wholeheartedly, with a clear conscience and honesty. The Supreme Buddha knew very well that the Dhamma one selects has a significant impact on realizing about life. The Buddha frequently instructed that one should follow mostly pure things instead of mostly beautiful things. Going for refuge to the Noble Triple Gem is an extremely pure thing to do. “Oh Monks, one who does not accept, disbelieves, and doubts the Enlightenment of the Tathāgata is a poor person. Such a person lives in spiritual poverty. “Oh Mahanāma, this is the kind of confidence that a sincere disciple should have. He wholeheartedly accepts the Enlightenment of the Tathāgata. He recognized the qualities of the Supreme Buddha in this manner: He wholeheartedly accepts the Blessed One’s quality of araham – for conquering the deceitful web of ignorance and eradicated all defilements such as greed, hatred, and delusion. He wholeheartedly accepts the Blessed One’s quality of sammāsambuddho – for realizing the truth without anyone’s help, with his own knowledge and effort. He wholeheartedly accepts the Blessed One’s quality of vijjācaranasampanno – for being endowed with virtue of the highest purity, an extremely well-concentrated mind, and dispelling ignorance to achieve true knowledge. He wholeheartedly accepts the Blessed One’s quality of sugato – for striving mightily to achieve liberation, following the noble path, and successfully achieving the blissful state of Nibbāna. He wholeheartedly accepts the Blessed One’s quality of lokavidū – for discovering all secrets and mysteries, and achieving complete knowledge of the entire universe including the human world, hells, heavenly worlds, and the Brahma worlds. He wholeheartedly accepts the Blessed One’s quality of anuttaro purisadammasārathi – for having the ability to show the path to liberation for any human, god or brahma possessing the requisite merit to achieve liberation. He wholeheartedly accepts the Blessed One’s quality of satthā devamanussānaṁ – for being the only and beloved noble teacher of gods and humans. He wholeheartedly accepts the Blessed One’s quality of buddho – for unconditionally sharing and teaching the Dhamma that he had realized with supreme effort and sacrifice. He wholeheartedly accepts the Blessed One’s quality of bhagavā – for being the sole human being who was the Blessed One imbued with an unlimited array of amazing qualities. Meritorious disciples, let us wholeheartedly go for refuge to the Noble Triple Gem. Let us not go for refuge to any other person or any other thing whatsoever. How could we gain anything greater than going for refuge to the Blessed One, the Supreme Buddha who is the most honest, most virtuous, most wise, kindest, most intelligent, and the Noblest? It is not only this present life that becomes successful when one goes for refuge to the Noble Triple Gem with true realization. The next life will certainly be a happy one. Such fortunate disciple will not be born in a bad destination. This has been stated by the Blessed One himself. So it is very clear to us now. There is a great person who can relieve us of all our suffering in life, and provide encouragement, happiness, and good fortune. The Supreme Buddha’s power is amazing and immeasurable. This power extends across the universe. You can undoubtedly have the help of this noble power. We can have the help of this same power of the Buddha to fulfil all our hopes and to quickly negate the harmful impact of previous karma. The help of the Supreme Buddha can be used to gain the blessings and help of gods with right view. Furthermore, the help of the Supreme Buddha will pave the path to end suffering in this endless cycle of rebirths, to gain the fruits of the Noble Eightfold Path, and to achieve the true happiness of Nibbāna.